E is for Explore! : What Can You Do With A Slinky? What Can You Do With A Slinky? 1. Estimate - How many coils does a slinky have? How long is a slinky when stretched? How many steps will a slinky walk down before stopping? 2. Count the number of coils on a slinky. Do all slinkies have the same number of coils? Also, count how many steps your slinky walked down. 3. Measure - Have each student hold one end of the slinky and pull it outwards, stepping away from each other. Now, find the length of your slinky. Measure the length and width of a compact slinky. Now, find the diameter. Can you figure out the circumference? 4. Geometry / Physics - Test a slinky out on different angled inclined planes and record your data! Click here for the experiment! 1. Physical Science - Energy transformation - Talk about potential and kinetic energy. When a slinky is at rest, it has potential energy. Once you get a slinky moving, its potential energy transforms into kinetic energy! Gravity - Next, hold a slinky with your arm extended out (at head level) and drop it straight down. How does a slinky fall? Does it's bottom or top crash to the floor first? 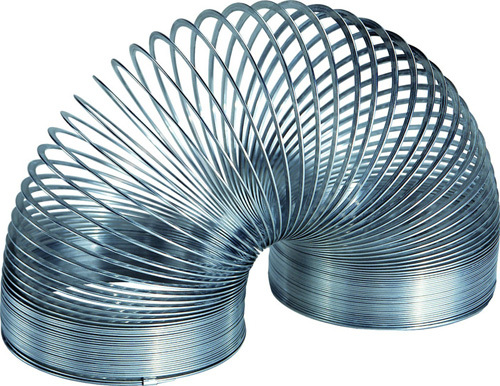 Do the springs spring the slinky back up into the air? Find out the answer here! 3. Universe - Check out a slinky in space! 1. Brush paint on a slinky's feet (the ends), cover an inclined plane with paper, and create walking slinky art! 2. Create circular prints by stamping a slinky. Try rolling, twisting, and turning a slinky's coils on paper to get a print. 3. Create a slinky pencil holder. 4. Hang a slinky from a string and create springing ceiling art!